With a plethora of young talent and shut down pitching, the Diamondbacks look poised to compete in a highly competitive NL West Division. They will have to beat out rivals the Los Angeles Dodgers and the San Francisco Giants in order to regain the NL West crown and continue their pursuit of bringing another World Series to Arizona. D-Backs had a disappointing 2016 as many things went wrong for them. A.J. Pollock suffered an elbow injury, Greinke and Miller weren’t impressive either and the Diamondbacks lost 93 games. As a result, general manager Dave Stewart was replaced with Mike Hazen and Torey Lovullo was hired to take manager Chip Hale’s role for the 2017 season. The team boasts of talented players like Paul Goldschmidt, David Peralta, Zack Greinke and Jake Lamb who can give the rivals a tough time. The D-Backs are looking to bounce back again this year after a successful 2017 season. The team made it to the playoffs for the first time since 2011 and played their first series as a Wild Card team against the Colorado Rockies. They persevered to make it to the NLDS but unfortunately lost to the Los Angeles Dodgers. This season they continue to have enough star power and talent to be among the NL West Championship contenders for 2018. To see how the team fares this season get your Arizona Diamondbacks tickets in time and be there to cheer them on. November 4: The 2001 World Series - The encounter between the Arizona Diamondbacks and THE New York Yankees for the 2001 World Series was indeed an epic one. Game seven of the series was termed as the Best Postseason Game of the Decade (2000–2009) by Sports Illustrated. In the best-of-seven series, the Diamondbacks emerged victorious by defeating the Yankees four games to three in front of an almost 50,000 crowd in Phoenix. For the Diamondbacks this was historic because the championship came to them in their fourth season which was a big achievement for the young franchise. Founded in 1998, this victory made them the Diamondbacks the fastest expansion team in Major League to have won the World Series Championship. It is the only World Series championship they have to their name. Game seven ended in a dramatic style with Gonzalez’s famous bloop hit that was to be remembered in baseball history. May 18, 2004: Randy Johnson’s Perfect Game - It wasn’t the best of times for Diamondbacks but in the midst of it all came the perfect game by Randy Johnson who was now 40 years old. It was May 18, 2004, where a crowd of 23,381, gathered at the Turner Field in Atlanta, witnessed the greatest moments in baseball history. Randy Johnson, the left-hander for the Diamondbacks, pitched the 17th perfect game in major league history and became the oldest player in baseball to throw a perfect game. Before him it was Cy Young who did so at the age of 37, almost a century back. The 40-year-old left-hander for the Arizona Diamondbacks retired all 27 batters he faced to lead the Diamondbacks to a 2-0 perfect-game win by beating the Atlanta Braves. Diamondbacks are still a young franchise so the rivalries it has do not have the longevity that others teams have. This does not mean that the Diamondbacks hasn’t had its share of contentious moments with opponents. Los Angeles Dodgers - Though it is a new rivalry, but in the short span of time the two teams have witnessed it all - brawls, fiery confrontations between players and allegations. The origins of the rivalry between the D-backs and the Dodgers can be traced back to the 2011 season. It all started with Dodgers reliever Hong-Chih Kuo, when he threw a pitch that almost hit Arizona's Gerardo Parra. Some bad words were exchanged between the players from both teams. The next day Clayton Kershaw was ejected for hitting Gerardo Parra. This marked the first sign of a budding rivalry. The two teams had a bench-clearing altercation in 2013 at Dodger Stadium that is also remembered as the “fight of the season.” It resulted in players from both the teams being fined or suspended. And then there was the famous pool incident. The Diamondbacks accused the Dodgers that after winning the National League West title with a 7-6 victory, the players celebrated it by jumping in their pool and some players even urinated in it which was disrespectful and annoying. Diamondbacks think of Dodgers as a bunch of arrogant players who do not know how to behave and the Dodgers’ dislike for the D-backs is also quite evident. Several incidents have fueled the rivalry over the years and the rivalry has all the ingredients for a spirited showdown. In 29 days, the team won 21 games and lost just one. It was the season that the Rockies won the National League Pennant by defeating Arizona in four straight games. That was a memorable season for the Rockies who had a talented bunch of players, but not a memorable one for the Diamondbacks. The Arizona Diamondbacks have many talented players who have made valuable contributions to the franchise. One such name is that of Randy Johnson who is also known by his nickname “The Big Unit.” He is regarded as an elite athlete and one of the best pitchers. Johnson was inducted into the MLB Hall of Fame in 2015. He has awon the Cy Young Award five times and a World Series MVP award which was given to him in 2001. Another player worth mentioning is Luis Gonzalez also known as "Gonzo." He wasteh Diamondbacks star player. The former MLB outfielder is remembered for his game-winning single in Game seven of the 2001 World Series which gave the D-Backs its first World Championship. The five-time All-star has the honor of being the first former player to have his number (20) retired by the D-backs on August 7, 2010. Gonzalez won the Silver Slugger Award in 2001. Arizona Diamondbacks plays its live games at the Chase Field. Located in Downtown Phoenix, it opened in 1998, the same time the Diamondbacks were founded. Since then it has entertained many exciting games and huge crowds who come to watch one of the most competitive franchises in the MLB. Diamondbacks always put on a great show for their fans with their fiery performances. This season the D-Backs are all set to battle it out with their rivals to grab the NL West trophy. It has a talented roster and with the changes, the team has its hopes high. Fans are also looking forward to seeing their favorite team in action. 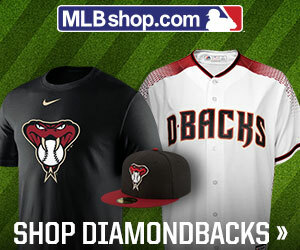 If you are looking for Arizona Diamondback season tickets then get them here now. It looks like a promising season and you would not want to miss out on all the fun. Our process for purchasing cheap Arizona Diamondbacks tickets is simple and fast. There are so many online ticketing sites, that it can be hard for customers to find the right place to buy Arizona Diamondbacks tickets at the cheapest price. At ScoreBig we think of our customers first and foremost. We offer daily deals for Arizona Diamondbacks events, so our customers can get the best seats for the best prices. ScoreBig will always go above and beyond to offer the cheapest Arizona Diamondbacks tickets on the market. The Arizona Diamondbacks schedule above, displays all available events for 2019 and 2020. Once you find the event that you would like to go to, click the red “Get Tickets” button. It is located on the right-hand side of the event listing, it will take you to an Arizona Diamondbacks event ticket page. ScoreBig's event ticket page will display all available Arizona Diamondbacks tickets for that event. On the event ticket page to help with your search for the right Arizona Diamondbacks tickets, use the filters at the top to select quantity, price range, and more. There is also an interactive seating chart so you can pick where you want to sit. When you are ready to buy a ticket, click on the listing, and you will be directed to ScoreBig's checkout page. Upon completion of the information fields, your order will be processed and your Arizona Diamondbacks tickets will be delivered via email, mail, or to your mobile device. What makes ScoreBig’s site stand out from the rest? We are constantly analyzing our competitors to improve our site, service, and prices. ScoreBig.com employees strive to offer the best process and experience to buy cheap Arizona Diamondbacks tickets. Our goal is to get you the best seats to Arizona Diamondbacks events. We offer daily discounts on our site and for special promotions check out our newsletter. If there are no Arizona Diamondbacks events currently available, you can use our search feature at the top of the page to see a list of all popular events going on near you. No matter your price point, we have all the best deals and discounts on Arizona Diamondbacks tickets. For more information on prices of Arizona Diamondbacks tickets and the schedule for Arizona Diamondbacks, check out our listings above. The last thing you want to find out is when the Arizona Diamondbacks event you wanted to go to is sold-out. Don’t worry in many cases ScoreBig has affordable tickets to sold out events. We sell tickets from GA all the way to premium seating and parking. Skip the scalpers in the parking lot and get your tickets online from top Arizona Diamondbacks ticket brokers. We get you in all events, buy your Arizona Diamondbacks tickets here from a brand that many trust and rely on for all their ticketing needs. ScoreBig offers a 100% money-back guarantee. If you have been in search of cheap tickets for Arizona Diamondbacks, ScoreBig by far is the best option. That’s why ScoreBig has more loyal customers than any other ticketing site. Shop at ScoreBig for safe and secure Arizona Diamondbacks event tickets.